If the Z88 does not switch the display on when you press both Shift keys, or if it flashes on, but then goes off again there are several things that you can do. Please work through the tests methodically. Is the Contrast control in the middle? Is the Card Flap shut? Try switching it on with the Mains Adapter plugged in. If it works, - Check Batteries. If not, do a Soft Reset. (Continue to Hard Reset). The Mains Adapter can fail without you realising it. The `Battery LOW' symbol only comes on if BOTH the Mains Adapter AND the internal batteries are low (if you are using the Mains Adapter). To check it you need to connect a VOLTMETER across the plug that you plug into the Z88. The positive side is the centre of the plug (RED) and the negative side is on the outside (BLACK). The correct voltage is 6.5. While measuring the voltage you should wriggle the wire where it goes into the plug. Often the cable becomes broken internally where the wire gets continually bent. This can give an intermittent fault. If you have this intermittent fault, you can either replace the Mains Adapter or cut the wire at the plug end. Remove the faulty part of the cable, and solder another plug onto the end of the wire. If there is no output, - the unit is faulty. The simplest action is to replace this low-cost item completely. If the Mains Adapter is cold, after being plugged into the mains for some time this points to another fault. Sometimes if it has been dropped, the transformer inside breaks the track on the Printed Circuit Board. Dismantling the case and resoldering the track with thicker wire may correct this. Unless you are competent with a soldering iron do not attempt these repairs. Get a new Mains Adapter. 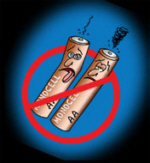 Check Batteries - Just because they are new, doesn't mean they are alright! With a working Mains Adapter plugged into the Z88, remove the batteries. Check these individually with a VOLTMETER. The reading should be 1.5 volts for new batteries. If any of the batteries are below 0.9 volts, all four batteries should be replaced with a new set. Sometimes the ends of the batteries become dirty and prevent them making contact. The Z88 uses low current which is not high enough to clean them. Clean the ends with a clean, abrasive cloth. If nobody important is looking, use a shirt sleeve. DO NOT USE RE-CHARGEABLE BATTERIES INSIDE YOUR Z88. If the Z88 has been dropped, sometimes the plastic lugs that hold the battery connectors are broken. You can check this by seeing if the batteries are not held together tightly when you put them into the Z88. You can repair this either by sticking the plastic lug back, or by replacing the bottom cover of the Z88. WARNING Before doing a Soft Reset make sure there are NO FILES in your:RAM.- device. See Bug - :RAM. If the soft reset is not successful, - you may get a Hard Reset. To do a soft reset make sure that the card flap is CLOSED, press the reset button twice. You should see SOFT RESET appear in the top left-hand corner of the screen. If you have any RAM packs fitted, you should remember to set the Panel (S) Default Device to :RAM.1 and change the Device in the Filer (F) to :RAM.1. These will be set to the internal ram :RAM.0 after a reset. After a successful Soft Reset, you should do a Hard Reset as soon as possible. This is because a soft reset is designed to get you out of trouble rather than completely resetting the Z88. It is possible for the gremlin that caused your Z88 to go wrong is still there, waiting to strike again. Doing a Hard Reset puts the Z88 into a known state. A reset one. You must backup your files between a Soft Reset and a Hard Reset. See Backing up Files. If the Z88 still hasn't worked, you should remove all the RAM, ROM and EPROM Cards from the Z88 and try another Hard Reset. If it still isn't working, things are looking desperate here. Remove all batteries and allow the Z88 to stop completely for 15 minutes, then replace the batteries and try another Hard Reset. If the Z88 doesn't power up here then it is faulty. A Hard Reset is used when starting a Z88 from scratch or as a `last resort' to get a crashed Z88 working again. run a BOOT.CLI file (if you have one) in an EPROM pack. To do a Hard Reset, you should OPEN the card slot, have all your RAM and program cards you wish to use plugged in the slots. Press the reset button twice, then shut the card slot cover. You should see HARD RESET... appear in the top left-hand corner of the screen. The Time and Date (T) also need to be set. If it does work, you should try replacing the Cards back into the Z88 one at a time. Do a Hard Reset between times so that you can establish which card is causing the fault. Printer is `ON-LINE' and the `ready' light is on. Cable is connecting properly at both ends. Has the square cursor disappeared? Yes - The Z88 wants to send text but can't. Press ESC. You should see ESCAPE appear at the top left-hand side of the screen. No - You have not issued the <>PO command. If your Printer, Modem, PC Link or anything that is plugged into the Serial Port simply stops working, your Serial Port may have locked up. The cure for this is to give your Z88 a Soft Reset which will reset the communication buffer and registers that tell it what to do.